ABOVE: Sarah Beeny, who once saucily remarked that she didn’t mind if male admirers watched her programmes because of her cleavage, as long as it boosted ratings! MIDDLE: Sarah and her husband, Graham Swift, in front of Rise Hall, their 97-room mansion in East Yorkshire which they restored as a venue for weddings and other events. Sarah fronted a Channel 4 programme, Beeny’s Restoration Nightmare, about their struggles to restore the hall in the face of problems with the planning authorities. 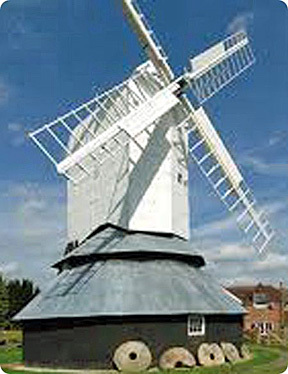 BOTTOM: The windmill at Windmill Hill, Herstmonceux, East Sussex, a Grade II* listed post mill which has been restored by a trust. Founded about 1814, the mill was for many years in the 19th century in the ownership of Edward Beeny (1802-1872), who was Sarah Beeny’s great great great great grandfather. There are some old photos of the mill as it once was further down the page. These were kindly supplied by the Windmill Hill Windmill Trust, details of which can be found at the end of the blog. 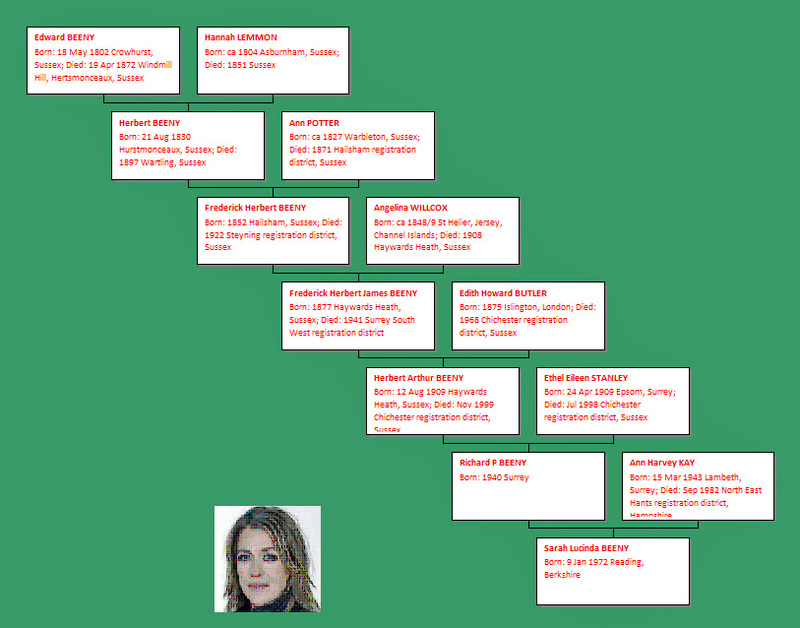 Descent of Sarah Beeny to seven generations from her great great great great grandfather Edward Beeny, miller and entrepreneur, at Herstmonceaux, Sussex. 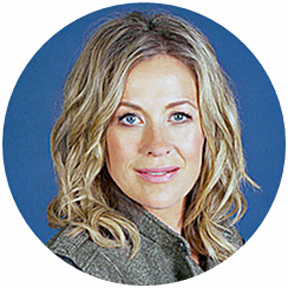 SARAH BEENY, mother-of-four sons, property developer and buxom television presenter, is best known for presenting the Channel 4 property shows Property Ladder, Property Snakes and Ladders, Streets Ahead, Britain’s Best Homes, Help! My House is Falling Down, Beeny’s Restoration Nightmare, Double Your House for Half the Money and Sarah Beeny’s Selling Houses. She has her own website at: http://www.sarahbeeny.com/ She has also written seven books. After her mother died at only 39 of breast cancer when Sarah was 10, she was educated as a weekly boarder at the all-girls Luckley-Oakfield School in Wokingham, Berkshire, where, she once recalled in an interview: “We used to show our bosoms to the local builders and our mission was to snog boys.” Her sauciness continued after she had achieved television fame, for she remarked that she didn’t mind if her legion of male admirers watched her property programmes principally to view her bosom, as long as it increased the ratings! Without any formal training, Sarah founded her property business with her brother and husband and was subsequently talent-spotted as a TV presenter, since when she has become a well-known national figure. In my researches into her ancestry and family tree, it soon became apparent that her entrepreneurial acumen is in the blood, for her paternal ancestors were tradesmen and businessmen who became successful. Sarah Lucinda BEENY was born on 9 January 1972 in Reading, Berkshire. However, the Beeny family originated in Sussex for as far back as I have been able to discover. Richard P BEENY was born in 1940 in Surrey. Ann Harvey KAY and Richard P BEENY were married in 1963 in Chichester registration district, Sussex. Ann Harvey KAY was born on 15 March 1943 in Lambeth, Surrey. She died in September 1982 at the age of 39 in North East Hants registration district, Hampshire. Herbert Arthur BEENY was born on 12 August 1909 in Haywards Heath, Sussex. He died in November 1999 at the age of 90 in Chichester registration district, Sussex. Ethel Eileen STANLEY and Herbert Arthur BEENY were married in 1938 in Surrey South West registration district. Ethel Eileen STANLEY was born on 24 April 1909 in Epsom, Surrey. She died in July 1998 at the age of 89 in Chichester registration district, Sussex. Frederick Herbert James BEENY was born in 1877 in Haywards Heath, Sussex. He died in 1941 at the age of 64 in Surrey South West registration district. He was a grocer and provisions dealer. Edith Howard BUTLER and Frederick Herbert James BEENY were married in 1904 in Horsham registration district, Sussex. Edith Howard BUTLER was born in 1875 in Islington, London. She died in 1968 at the age of 93 in Chichester registration district, Sussex. Frederick Herbert BEENY was born in 1852 in Hailsham, Sussex. He died in 1922 at the age of 70 in Steyning registration district, Sussex. He was a draper and grocer in a very substantial way of business. Angelina WILLCOX and Frederick Herbert BEENY were married on 21 October 1875 at the Parish Church of St Peter, Stepney, Middlesex. Angelina WILLCOX was born about 1848/9 in St Helier, Jersey, in the Channel Islands. She died in 1908 at the age of 59 in Haywards Heath, Sussex. I say that Frederick Herbert was in business in a substantial way. His drapery and grocery store in the town centre of Haywards Heath, Sussex, was known as the Sussex Emporium and in the census of 1901 there were a remarkable TWENTY-ONE people listed as living there! The inhabitants included Frederick himself, wife Angelina, three children, a visitor and 15 employees. Clearly, the building in which they were all living must have been of some considerable size. 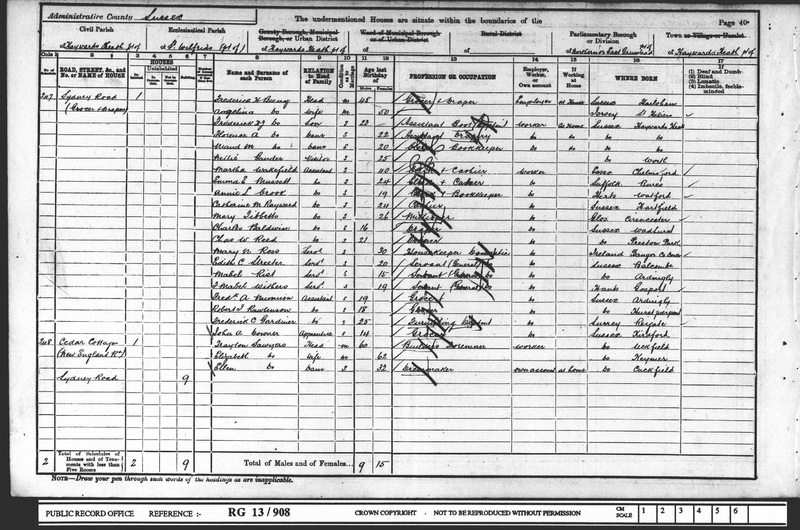 The 1901 census in which no fewer than 21 people are shown as living in the household of Frederick Herbert and Angelina Beeny and their children. Herbert BEENY was born on 21 August 1830 in Hurstmonceaux, Sussex. He was baptised in 1831 at All Saints, Hurstmonceaux. He died in 1897 at the age of 67 in Wartling, Sussex. Herbert was a grocer and draper. Ann POTTER and Herbert BEENY were married on 31 December 1851 in Eastbourne, Sussex. Ann POTTER was born circa 1827 in Warbleton, Sussex. Herbert and Ann Beeny had at least seven children but Ann died in 1871 at the age of 44 in Hailsham registration district, Sussex. After her death, Herbert remarried twice, firstly to a much younger woman, Caroline Amelia Crowhurst, but she died aged only 23, and Herbert then married her elder sister Naomi. By the sisters, he had three more children. An advertisement by Herbert Beeny for his draper’s business at Windmill Hill in the Sussex Advertiser 1877 (from the British Newspaper Archive). Edward BEENY was born on 18 May 1802 in Crowhurst, Sussex. He died on 19 April 1872 at the age of 69 at Windmill Hill, Hertsmonceaux, Sussex. He was a miller, farmer, baker and brickmaker. Hannah LEMMON was born circa 1804 in Asburnham, Sussex. Edward and Hannah Beeny had 12 children. She died in 1851 at the age of 47 in Sussex. After Hannah’s death, Edward Beeny married again in 1854 to Sarah Packham WILSON. The history of the Post Mill at Windmill Hill, a fine example of our Industrial Heritage, is characterised by the presence of Edward Beeny who was the owner of the Mill, Mill House and associated buildings for some 42 years. During that time he was the miller and controlled the overall operation as well as owning some other external businesses. Edward was baptised in 1803 in Crowhurst, the son of Stephen and Anne Beeny, but little is known of his early life apart from the understanding that he was apprenticed to a local miller. He married Hannah Lemmon at the Church in Ashburnham on 26th May, 1823 and in the next 28 years they had 12 children including triplets in 1851. Sadly Hannah died soon after the triplets were born and three years passed before Edward remarried Sarah Packham [sic, Edward’s second wife was Sarah Packham Wilson] at Mayfield on 4th July 1854. We assume it was the business acumen that prompted Edward to arrange for the first eight children to be baptised together as a ‘job lot’ on the 23rd July 1837 at Herstmonceux! 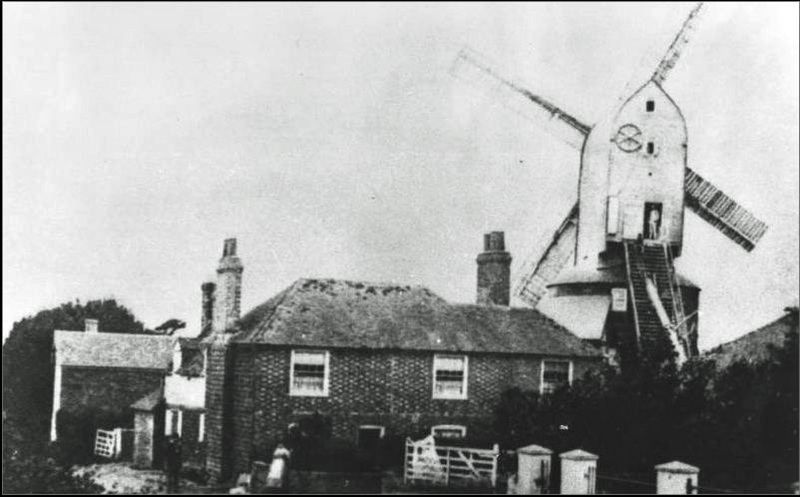 Edward became the owner/miller at Windmill Hill in 1830, taking over from Richard Oxley, and such was his ambition to succeed that almost immediately he offered a three year apprenticeship at the mill to a Michael Porter, aged 16, for the sum of £29. When this apprenticeship was complete he offered a further apprenticeship to Thomas Kine, aged 15, for the sum of £30 and other similar appointments followed. Edward’s business was obviously going from strength to strength for by 1846 he had taken occupancy of Chilsham Farm and by the time of the 1851 Census he was seen to be a farmer of 77 acres employing 9 men as well as employing 8 men at the mill. One assumes Edward had been looking for a retail outlet for his products for in March 1852 he bought the Village Stores for £250 from John Kemp and subsequently installed his son Herbert as manager. By 1861 Edward had increased his farming business to 130 acres and was now employing 20 men and the census of this year indicated that he had also bought a brickyard and a pottery located to the west of Victoria Road and was busily producing bricks. By the 1871 Census Beeny had disposed of 20 acres of farmland, the brickyard was no longer in his possession and he employed 9 men and 2 boys, clearly a change of fortune. It is reported that his health by now was suffering due to years of his lungs being exposed to dust from the grain and farming in general and he decided to sell up. 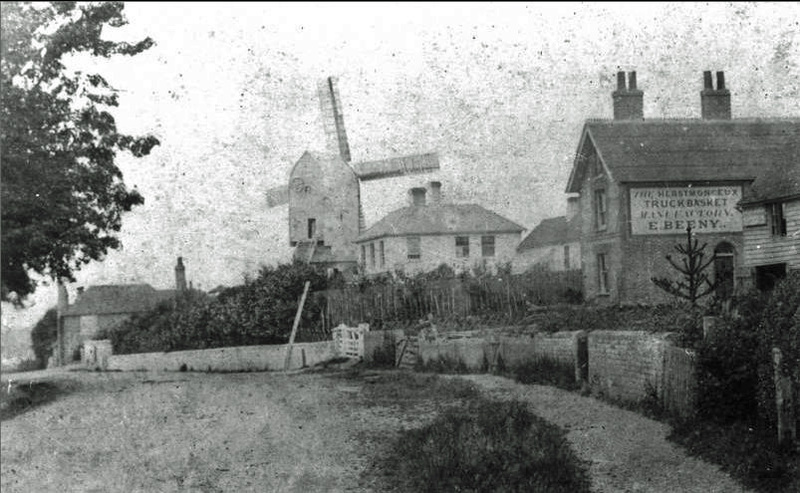 In August 1871 the windmill, the village stores and all the buildings were put up for auction by Burtenshaw of Hailsham but before it was sold Edward died in 1872 and his son Albert continued to manage the business for a further year. At the time of his death, put down to Bronchitis and congestion of the lungs, Edward left behind a widow, 12 children and 40 grandchildren. He had carried on the business of miller for 42 years, much longer than any other owner, and he was buried in Herstmonceux churchyard on 3rd May 1872. It is perhaps ironic that one of his legacies was the raising of the mill height as a result of an unresolved dispute with his neighbour Mr Jesse Smith at the house next door i.e. ‘Mount Pleasant’. This is the house that was reputedly built too high and although it has not been possible to see the Court papers at this time, nevertheless, the action raises the question as to why the action was ever started as ‘Mount Pleasant’ is SE of the mill whereas the prevailing wind is SW. We may never know, but it gave rise to the largest Post Mill in Sussex and the second tallest Post Mill in the country. Two old photographs of the Windmill Hill windmill. The dates of the photos are uncertain, but the top picture shows the name E. Beeny above a nearby building, though Edward died in 1872. However, it’s possible the E. Beeny named was one of Edward’s numerous sons (photographs courtesy of David Calvert and the Windmill Hill Windmill Trust). FamilySearch (https://familysearch.org/), the website of the Church of Jesus Christ of Latter-day Saints, for extracts from Sussex parish registers. 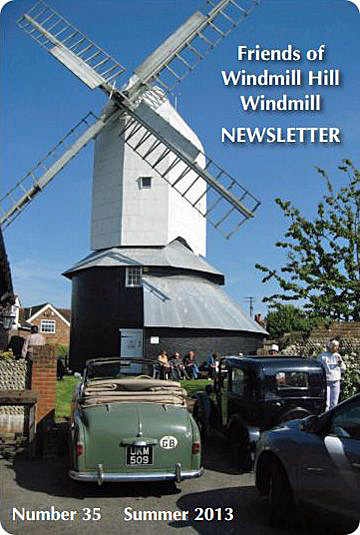 The Windmill Hill Windmill Trust, whose website has much valuable information about the windmill and its restoration at: http://windmillhillwindmill.org/, with special thanks to Bee Frost, Michael Chapman and David Calvert for permission to use photos, the newsletter article and general assistance.